The Lilburnes were originally a Northumberland family, taking their name from the villages of East and west Lilburn, in the Parish of Bamburgh, Northumberland. A Robert of Lilburn was one of the 24 knights who, in 1245, surveyed the boundaries between England and Scotland. In the following century the family spread over the county, but it was John of Lilburn who, in the early 14th century, raised the family both to fame and to the ranks of the great landowners. He was the nephew and heir of Christine of Lilburn, through whom he inherited “livery of the manor of Lilburn as one knight’s fee” on October 26th 1324. He was knighted, becoming the first Sir John Lilburn, at the King’s Court at Christmas, 1315, and a few months after was appointed Constable of Mitford Castle. He added considerably to his lands, including the barony of Stamford and Dunstanburgh, and was appointed Constable of Dunstanburgh Castle in 1323, where he built the famous Lilburn tower, part of which is still standing. He was Commissioner of Array in Northumberland in 1325 and sheriff of Northumberland in from 1327 to 1329. Sir John Lilburn attended Parliament at York in February 1328; to the Parliament summoned to meet on November 12 1384, his grandson, another Sir John, was called. This Sir John was resident at Shawdon when a son was born on February 22 1387. Sir John rode to Alnwick and invited Henry Percy, first Earl of Northumberland, and the Abbot of Alnwick Abbey to be the child’s godparents. The Earl was actually present at the child’s baptism at Bolton church – evidence of the family’s powerful connections. The grandson of this Sir John became Constable of that very Alnwick Castle to which his grandfather had ridden in 1387 to summon a Percy to a Lilburn baptism. By this time Lilburnes were already settled in the neighbouring county, for a William Lilburne is recorded about 1380 as holding land at Thickley, in County Durham, by right of his wife. In 1434, another William, brother of the Constable of Alnwick Castle, received by grant of Robert Ogle of Bothell “the manors of Thickley Punchardon and Shildon, co. Durham and all his messuages, lands etc there.” The reason for the grant is obscure, but William and his descendents remained at Thickley Punchardon and were independent of the Northumberland Lilburnes. William’s great granddaughter, Margaret, married a Claxton. His Great, great grandson, Bartholomew, attended the field of the Cloth of Gold and left magnificent body armour and other effects to his sons. One of these sons, John, married Isabel Worthy. The three sons of this John and Isabel were Richard, George and Joseph. Sir John Lilburne I was born c1279 and died c1355. A pedigree following visitations in 1575, 1615 and 1666 show him to be the son of William Lilburne, who in turn was the son of Sir William Lilburne, warden of the Middle Marches. He was probably the Sir John knighted in 1315 and who was appointed Constable of Dunstanburgh Castle in 1323, where he built the famous Lilburn tower. 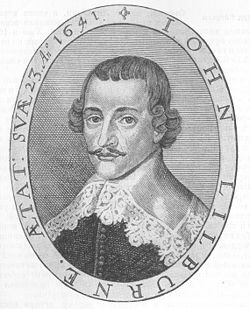 Sir John Lilburne II was born about 1294, son of the first Sir John Lilburne. He had a son, John Lilburn.